While reusable bags seem to be the way of the future, biodegradable shopping bags can help fill the gap in store-provided bags that don't harm the environment. 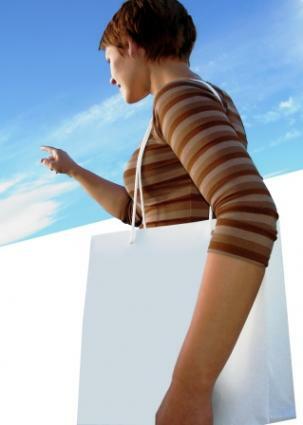 Shopping bags that are provided by retailers have come under a lot of fire in recent years. The debate over whether or not paper is better than plastic, couple with the growing concern over plastic bags ending up in the ocean, has led many shoppers to bring their own, reusable bags with them on shopping trips. Are Plastic Shopping Bags a Problem in Our Environment? What about those times you leave your bag at home, or you buy more items than your personal shopping bag can hold? For those times, shopping bags that are biodegradable can be the answer. While 100 percent paper shopping bags are completely biodegradable, most retailers hesitate to offer them. Paper bags can be expensive to purchase, and the best bags for the environment are those that are made with a higher percentage of recycled product. Many paper shopping bags are also reinforced with plastics, waxes, chemicals, and other products to help them hold up to heavy purchases. These reinforcements rob the bag of its biodegradable attribute and eliminate any benefit to the environment in using a paper bag. Standard plastic bags, such as the kind used in most grocery stores can take a minimum of 20 years to begin breaking down in composition. What little biodegrading that does take place is incomplete and plastic chemicals and compounds leach into the surrounding environment, poisoning it. Recycled, reusable shopping bags are a great alternative to standard shopping bags, yet aren't always the most practical solution. Shoppers can forget to bring them along, not have them on hand for impulse purchases, not have the right bag size for the purchase being made or not have enough bags. The cost of reusable bags can also be a deterrent to some consumers who expect the retailer to provide a bag for their use. Ability to Break Down in Different Environments: Some products claim to be biodegradable, meaning that if they are exposed to the correct set of conditions, frequently unseen in most landfills, they will break down within months to years. Biodegradable bags made of natural materials can break down in nearly any environment, including salt water, an answer to the plastic bags in the ocean dilemma. Compostable: Biodegradable plastics being manufactured today are certified compostable as well as biodegradable. This means they are completely safe, not leaching plastics or other contaminants into the environment. Soy Inks: To make sure that biodegradable bags are not only environmentally friendly, but business friendly as well, soy inks can be used in the printing process for logos. These inks will not contaminate the environment after the bag has been discarded. If you are a retailer interested in offering your customers a safe alternative to standard plastic bags that are biodegradable, then consider using any of these resources. Biodegradable shopping bags can the alternative to plastic bags that many retailers and consumers are seeking: a safe bag that breaks down in compost piles and oceans that can be provided at most retail stores. While a reusable bag is still best, both for manufacturing and cost savings, a biodegradable bag is a close second choice for many.